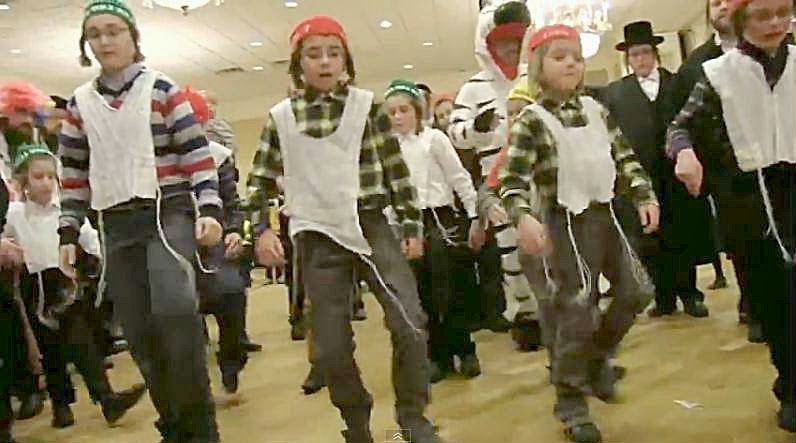 Hundreds of families came together this week in the Brooklyn neighborhood of Williamsburg for a special pre-Purim party. It was sponsored by Achim B'yachad, the Chassidish division Of Chai Lifeline. Both organizations find ways to bring joy to the lives of young patients and their families through creative, innovative, and effective family-centered programs, activities, and services. Fighting illness with love, Achim B'yachad restores the light of childhood to children whose innocence ended when cancer, life-threatening, or lifelong illness was diagnosed. I liked this, much love shown for a worthy cause...but only by men?? I realize I am showing my ignorance here..
Laudable, indeed. How wonderful that these men want to help children feel better. But, I did not see any women performing. Oh, Right, this is only for ultra-Orthodox families and no women would be allowed to sing or dance or be happy. I noted very few girls in the setting. And, where they were obvious, they were passive watchers, not participants. If this group really wants to help ill Jewish children, why to push your boundary and perform in other settings, beyond the ultra-Orthodox and include the other half of the world.